Lewis Lee Millett Sr. (December 15, 1920 – November 14, 2009) was a United States Army officer who received the Medal of Honor during the Korean War for leading the last major American bayonet charge. He enlisted in the U.S. National Guard while still in high school and then in 1940 joined the U.S. Army Air Corps. When he thought that the United States would not participate in World War II he deserted and went to Canada with a friend where they joined the Canadian Army and were sent to London. The U.S. did enter the war and by the time he made it to Europe they were in the fight so he transferred to the U.S. Army. While serving with the Army in World War II, he received a Silver Star for driving a burning ammunition truck away from a group of soldiers before it exploded. During the Korean War, he was awarded the United States military's highest decoration, the Medal of Honor. The citation explains that he successfully led a bayonet charge against the enemy. He later served in the Vietnam War as well. He retired from the Army in 1973 and died of congestive heart failure in 2009. Millett was born on December 15, 1920, in Mechanic Falls, Maine. He grew up in South Dartmouth, Massachusetts, having moved there with his mother after his parents divorced and his mother remarried. His grandfather had served in the American Civil War and an uncle fought in World War I with the 101st Field Artillery Regiment of the Massachusetts Army National Guard. While still attending high school in Dartmouth, he enlisted in the Massachusetts National Guard in 1938 and joined his uncle's old regiment, the 101st Field Artillery. In 1940, he joined the United States Army Air Corps and entered gunnery school. When it appeared that the U.S. would not enter World War II, Millett, eager to fight, deserted in mid-1941. With a friend who had received a bad conduct discharge from the U.S. Marine Corps, Millett hitchhiked to Canada and enlisted in the Canadian Army. Assigned to the Royal Regiment of Canadian Artillery, he was sent to the United Kingdom, where he served as an anti-aircraft radar operator in London during the Blitz. By the time he arrived in the United Kingdom, the U.S. had entered the war; Millett transferred to the U.S. Army in 1942. Assigned to the 27th Armored Field Artillery Regiment, 1st Armored Division, Millett served in Tunisia as an anti-tank gunner during Operation Torch. During an engagement there, he drove a burning ammunition-filled half-track away from Allied soldiers, jumping to safety just before it exploded. For this action, he was awarded the U.S. military's third-highest decoration, the Silver Star. He later shot down a Messerschmitt Bf 109 fighter plane using half-track mounted machine guns. Millett, by then a sergeant, next took part in the Allied invasion of Italy and fought in the Battle of Salerno and the subsequent Battle of Anzio. It was at this time that the U.S. Army discovered Millet's 1941 desertion; he was court-martialed, convicted, ordered to pay a US$52 fine, and stripped of his leave privileges. Only weeks later, he was given a battlefield commission to second lieutenant. After World War II, Millett attended Bates College in Lewiston, Maine, for three years before being called up to serve in the Korean War. By February 7, 1951, Millett was serving in Korea as a captain and commander of Company E of the 2nd Battalion, 27th Infantry Regiment. On that day, near Soam-Ni, he led his company in an assault on an enemy position atop Hill 180 near Anyang. When one platoon became pinned down by heavy fire, Millett took another platoon forward, joined the two groups, and led them up the hill. Wielding his bayonet and throwing hand grenades, Millett yelled encouragement to his soldiers throughout the hand to hand fight. Upon reaching the top of the hill, his men stormed the enemy position and forced the opposing soldiers to withdraw. Although wounded in the shin by grenade fragments, Millett refused to be evacuated until the position was secured. Historian S.L.A. Marshall described the attack as "the most complete bayonet charge by American troops since [the Battle of Cold Harbor]". Out of about 50 enemy dead, roughly 20 were found to have been killed by bayonets, and the location subsequently became known as Bayonet Hill. 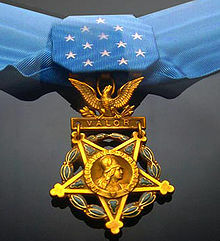 For his leadership during the assault, Millett was awarded the Medal of Honor. The medal was formally presented to him by President Harry S Truman in July 1951. After the Korean War, Millett attended Ranger School at Fort Benning, Georgia. He served in the 101st Airborne Division as an intelligence officer and later served in the Vietnam War as a military advisor to the controversial Phoenix Program, which aimed to root out and kill Viet Cong sympathizers. He also helped found a "Recondo" (reconnaissance–commando) school which trained small units for deployment to Vietnam. In the mid-1960s, he commanded the Army Security Agency training center at Fort Devens, Massachusetts. In 1963, he earned a Bachelor of Arts degree in political science from Park College (now known as Park University) in Missouri. Millett retired from the military in 1973 at the rank of colonel. He later stated that he retired because he felt the U.S. had "quit" in Vietnam. After his military career, Millett served as a deputy sheriff in Trenton, Tennessee. He eventually moved to Idyllwild, California, where he would remain for the rest of his life. He regularly appeared at events celebrating veterans, both in the Riverside County area and elsewhere around the country. He was a member of the Congressional Medal of Honor Society and the California Commandery of the Military Order of Foreign Wars. Millett's first marriage, to Virginia Young, ended in divorce. During the festivities surrounding his Medal of Honor award in 1951, he met Winona Williams. The two were later married and had four children: Lewis Lee Jr., Timothy, John, and Elizabeth. By the time of Winona Millett's death in 1993, the couple had been married over 40 years. Millett's son John, an Army staff sergeant, was among more than 240 U.S. military members killed in 1985 when their airplane, Arrow Air Flight 1285, crashed in Gander, Newfoundland, while carrying them home from peacekeeping duty in the Sinai Peninsula. Millett died of congestive heart failure on November 14, 2009, one month short of his 89th birthday. He died at the Jerry L. Pettis Memorial VA Medical Center in Loma Linda, California, after being hospitalized four days earlier. He had experienced various health problems over the last few years of his life, including diabetes. His funeral was held December 5, 2009 at Riverside National Cemetery in Riverside, California and his grave can be found in section 2, grave #1910. Millett's military decorations include the Medal of Honor, the Distinguished Service Cross, the Silver Star, two Legions of Merit, three Bronze Star Medals, four Purple Hearts, and three Air Medals. His other United States military awards include the Combat Infantryman Badge, Ranger Tab, Good Conduct Medal, American Defense Service Medal, American Campaign Medal, European-African-Middle Eastern Campaign Medal, World War II Victory Medal, Army of Occupation Medal, National Defense Service Medal, Korean Service Medal, Armed Forces Expeditionary Medal and the Vietnam Service Medal. In 2009, a park in San Jacinto, California, was named in honor of Millett. Close up of Millett at the life size diorama at the National Infantry Museum, Ft. Benning, GA.
At the US Army Infantry Museum at Fort Benning, Georgia, one of the life size dioramas depicting notable Infantry actions is of Millett's bayonet charge up Hill 180 during the Korean War. Millett is clearly visible leading the charge preparing to bayonet a North Korean soldier. 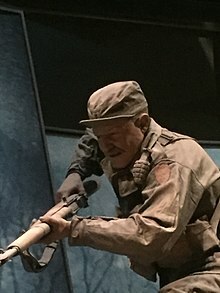 The life size diorama of Millett's charge up Hill 180 during the Korean War that resulted in his receipt of the Medal of Honor. 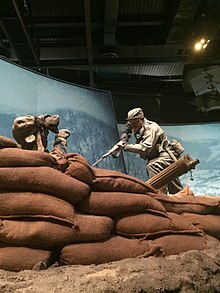 The diorama is at the US Army Infantry Museum, Ft. Benning, GA.
Wikimedia Commons has media related to Lewis Millett. ^ a b c d e f g h i Ghiotto, Gene (November 14, 2009). "Medal of Honor recipient Lewis Millett dies at age 88". The Press-Enterprise. Riverside, California. Archived from the original on November 23, 2009. Retrieved November 21, 2009. ^ a b c d e f g h i j k l m Lawrence, J.M. (November 19, 2009). "Lewis Millett; awarded Medal of Honor after bayonet charge". The Boston Globe. Boston. Archived from the original on November 23, 2009. Retrieved November 21, 2009. ^ a b c d e f g h i j k l Bernstein, Adam (November 18, 2009). "Daring soldier was awarded Medal of Honor". The Washington Post. Washington, D.C. Archived from the original on November 23, 2009. Retrieved November 21, 2009. ^ a b "Hallowed Ground Bayonet Hill, South Korea | HistoryNet". www.historynet.com. Retrieved 2018-07-21. ^ "Commentary: Not our Hill 180". Osan Air Base. Retrieved 2019-04-17. ^ a b "Medal of Honor recipients – Korean War". United States Army Center of Military History. August 3, 2009. Retrieved November 21, 2009. ^ Ham IV, Walter T. "Battle of Hill 180 remembered on 60th anniversary". USFK General News. Eighth Army Public Affairs. Archived from /usfk/(A(GwMzqRwXzAEkAAAAODM2NDg0N2EtODZjYS00NzgwLWE4MzctNThhNGE1MWMzNWVkTLZou97PY9LKShcF7_woodZpAJM1)S(u2e0xb55yruj5f55w1k0l2rb))/news.battle.of.hill.180.remembered.on.60th.anniversary.printview.748 the original Check |url= value (help) on October 24, 2014. Retrieved January 30, 2013. Kirchner, Paul (2009). More of the Deadliest Men Who Ever Lived. Paladin Press. ISBN 978-1-58160-690-4. "Lewis Millett". Hall of Valor. Military Times. Retrieved March 17, 2010.